In the offshore world Maples and Calder need little introduction. They have retained their massive footprint in their native market with the help of almost half a century of experience, and the story of their growth, accompanying the investment fund industry from its start as a niche sector to its position as an important part of the global financial system, has often been told. Like any successful business, Maples and Calder (“Maples”) has sought to consolidate its strong position as a leading full service international law firm, and also to push on. Maples strives to meet the needs of its clients and their instructing onshore counsel and continually reshapes its offerings to address the changing demands of the industry and marketplace. Their latest expansion move is to Singapore, which is now their second office, along with Hong Kong, in Asia, and their seventh worldwide, offering clients the option to access their world-renowned Cayman Islands, BVI and Irish practices with the added convenience of local support in their client’s own time zone and appropriate language. Although it does not come with a practicing local law like the move to Dublin in 2006, the move into Singapore is important for the law firm. Maples will not move unless they are certain that there is a viable asset management market that will need access to the Cayman, British Virgin Islands, or Irish law which Maples lawyers practise. They cede the small advantage of the early bird, but they can more than make up for it by thinking through the decision carefully, with a long-term view. Another part of their growth plan which was spurred by client demand for international reach is the extension of their cutting-edge e-services platform. This has been running for a few years now, offering 24-hour secure access to every part of a client’s individual account, from corporate records, to transactional documents, to important documents including legal opinions, billing information, important news and online conferencing. Crucially, the software updates their records automatically, without the need for separate input of data. Maples have shown a strong commitment to growing their business globally as a unified group, including their corporate service business, administrative fund services, and fiduciary services. In this, Maples are emblematic of one side of a real divide in the industry, by choosing very firmly to stay on the path of being able to offer a comprehensive range of services, as opposed to only attending to clients’ legal needs. This ability is central to the Maples model, and they would be a very different business if they followed the other fork which has come in the path of the offshore industry. They like cutting the middle man and increasing efficiencies by keeping it in-house; they don’t have to double up on know-your-customer (KYC) duties, for instance. Maples also believe that, coming from a name in which they trust, this ability is valuable to their clients. The number of launches has stayed relatively constant over the past year, as has the share of those launches worldwide which have been Cayman-based. This number is level in what is starting to be seen as a normal rate after the fall from pre-2008. What is slightly different, however, is the constitution of this group of launches. The period after the crisis was not a good time for untested managers to collect investments, partly because investors became increasingly wary, and partly because there was simply not the mass of potential investors. This has gradually started to change. Investor-driven changes may be the priority for managers, but the regulatory changes which have come in and which are still to come are unavoidable for any fund operating in the main jurisdictions, but especially those whose strategies could place them in the purview of multiple jurisdictions. FATCA from the US has been a big driver of work for lawyers with any US investors, who have had to comply with the withholding and reporting requirements from 1 January this year. On 15 March 2013, the Cayman Islands Government announced that it would adopt a Model 1 intergovernmental agreement with the US in relation to FATCA. This will simplify FATCA compliance for a range of Cayman Islands financial institutions that fall within FATCA’s scope. The decision has been welcomed by Maples who has been heavily involved in the consultation process in relation to FATCA. In Europe the biggest regulatory issue is of course AIFMD, which is starting to exercise managers looking to market in the EU. The directive is causing a lot of anxiety and, for the lawyers interpreting it, a lot of extra work. This is a clear burden for managers and service providers, but there are ways of finding workable solutions. For the short to medium term Maples foresee parallel structures as the way forward, with funds duplicated, but compliant with each of the separate regimes. For your typical London manager with a Cayman fund, this will not entail too much difference relative to some of the more overblown fears being voiced of the AIFMD putting an end to Cayman as a jurisdiction. The opposite has, in fact, happened, and a need for having an Irish and a Cayman fund is growing. What will be different is thatmanagers are going to have to consider their marketing strategies in detail. Those looking to actively target EU investors on a pan-European basis may want to go for an Irish fund, with the passport advantage which that now offers. However, the negative implications of this decision – notably full compliance with all the provisions of the AIFMD – including the depositary and remuneration requirements – have to be taken into consideration as well and may mean marketing in the EU on a more limited basis of existing national private placement regimes retains its attractions where funds would basically need only comply with the transparency and reporting provisions of the AIFMD. 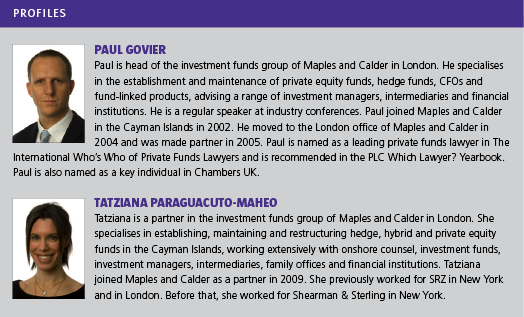 Another of the big issues, which Maples in particular will be watching, is the corporate governance review, initiated by CIMA, which is currently being debated in the Cayman Islands. It has generated a lot of attention, but despite welcoming the consultation initiative launched earlier in the year, Maples do not foresee changes as great as those being reported in some quarters. Corporate governance has certainly been in the spotlight recently, with the now infamous Weavering case standing as an emblem of what can go wrong if procedures are not robust. However, Govier believes that the prosecutions after Weavering paradoxically show that the regime is robust, as Weavering is the only case of note to emerge from the crisis. Whatever the outcome of the consultation, there is a general move towards a more uniformly rigourous governance regime worldwide. The differences in attitude between the US and Europe are being ironed out. Maples Fiduciary Services, an operating division of the MaplesFS Group, who provides specialised fiduciary services to a wide range of clients and structures, has a long and established experience in providing independent directors to investment funds and will continue to contribute to the debate and keep themselves informed of these changes.